Mariposa's landmark remains the state's oldest county courthouse in continuous use. One of the best examples of Greek Revival architecture in the Gold Country, the courthouse still contains many of the original, hand-planed furnishings, and a pot-bellied stove sits in the courtroom. Since there is no jury room, jurors deliberate in the jury box. 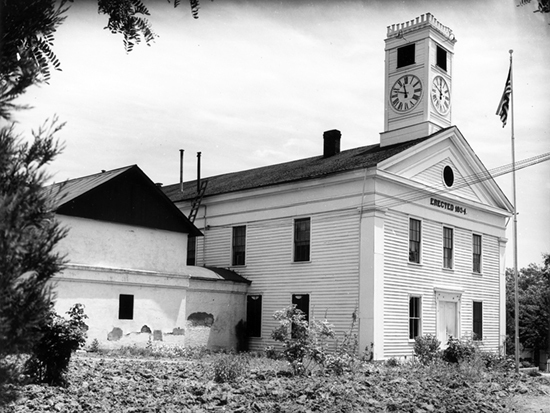 Among the alterations to the original structure was the addition of the clock tower in 1866. While one newspaper at the time questioned the need "to distinguish the exact time from a mile," the clock, shipped from England around Cape Horn, is today a popular fixture in Mariposa and continues to sound on the quarter-hour. The courthouse is listed on the National Register of Historic Places.